“this is a fantastic result for us all. The teamwork has been great – we feel that we train well together and we compete well together. This has been our goal for a number of years and we have finally got onto the podium and been rewarded with a medal. 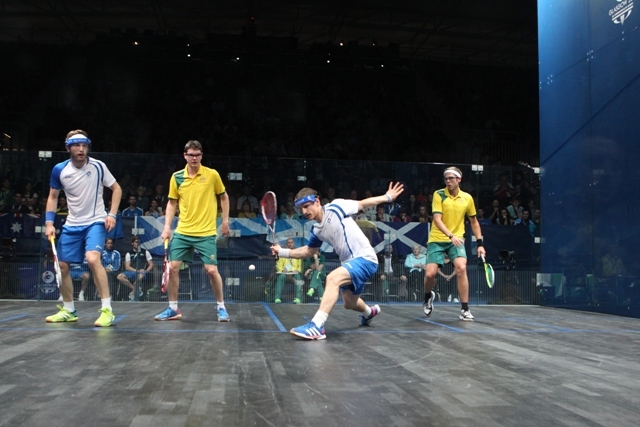 A great achievement for squash in Scotland”. Many congratulations to you all from Jim and I, the SSRL team and the Board at SSRL. We are very proud of you all. Kevin also recently highlighted to me the emotional impact that the medal has had on you as players. I hope that we as a team can use this emotion and channel it into even more great performances for Scotland’s Squash teams in the coming months and years. With this in mind I am taking the opportunity to remind us of our overarching performance goal. It is exactly two years until the Commonwealth Games in the Gold Coast, Australia. SSRL have set a target of achieving at least one medal in the Games and there is belief that our best opportunity is in Doubles. Bob, Martin and Paul have agreed that the first opportunity for us to prepare for the Commonwealth Games 2018 is the World Doubles in Darwin from 15th -18th August 2016. We are guaranteed one pairing in each event and with opportunities for medals in mind; we have entered teams in the men’s doubles and the mixed doubles. SSRL will consider selecting a second men’s doubles team and a second mixed team to travel to Darwin. We will select from those who demonstrate the potential to contribute to a medal winning performance in Darwin and in two year’s time in the Gold Coast. 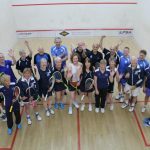 To be eligible for selection for the World Doubles Championships you and your preferred partner will be required to enter a Scottish Closed Doubles competition on 9th and 10th July 2016. Entry forms for the competition will be available online. 28, 29 and 30th June and 5, 6 and 7th July 2016. Selection for the mixed doubles will also be made during this time and expressions of interest for mixed doubles should be made to Paul Bell. Final selections will be made following the trials and the selection panel will consist of Bob Easson, Martin Heath and Paul Bell. This is your first opportunity to demonstrate your interest and commitment towards the doubles programme for Commonwealth Games Scotland 2018. 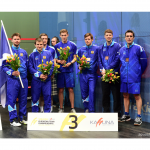 It is an opportunity for SSRL to open a selection process, and start to identify and prepare the best possible Scottish Squash Squad for 2018 and focus on bringing home a Commonwealth medal to add to our European medals.